Μετά το preview που δημοσίευσε η Mercedes-Benz πριν από λίγες ημέρες, ήρθε η ώρα να θαυμάσουμε το κτήνος που λέγεται G500 4×4² σε όλο του το μεγαλείο. Η Γερμανική εταιρία, χαρακτηρίζει την G500 4×4² ως “near series” concept που σημαίνει πως είναι πολύ κοντά στην παραγωγή. Το μοντέλο βαδίζει στα χνάρια της G63 AMG 6×6 και διαθέτει AMG εμπρός προφυλακτήρα, ανθρακονημάτινα flares στα φτερά, LED φώτα στην οροφή, προστατευτικά από ανοξείδωτο ατσάλι, πλευρικές απολήξεις της εξάτμισης και ζάντες ελαφρού κράματος 22 ιντσών με ελαστικά εκτός δρόμου. Εμφανισιακά –και μηχανικά- έχει “πάω παντού” χαρακτήρα αλλά παρότι δεν έχουμε φωτογραφίες να το αποδείξουμε, το ίδιο στυλ δεν συνεχίζεται και στο εσωτερικό που περιμένουμε να είναι πολυτελές. Κατά τα άλλα, η G500 4×4² έρχεται εφοδιασμένη με portal άξονες και ανάρτηση με δύο ελατήρια/αμορτισέρ ανά τροχό. Η εταιρία λέει ότι το ένα σετ ελατηρίου/αμορτισέρ λειτουργεί συμβατικά με standard χαρακτηριστικά ενώ το δεύτερο σετ, είναι ηλεκτρονικά ελεγχόμενο με μεταβαλλόμενα χαρακτηριστικά που μπορούν να αλλάξουν από “Comfort” σε “Sport” σε μόλις 15 millisecond. Επίσης, παρά τα 450 χιλιοστά απόστασης από το έδαφος και τις 52ο και 54ο γωνίες προσέγγισης και διαφυγής, η Mercedes λέει ότι η G500 4×4² έχει περισσότερο αίσθηση sports car παρά οχήματος cross country. Προφανώς το συγκεκριμένο πρωτότυπο προορίζεται για παραγωγή αλλά οι Γερμανοί λένε ότι η απόφαση θα εξαρτηθεί από την αντίδραση του κοινού… Μεταξύ μας τώρα, θετική θα είναι η αντίδραση και η απόφαση έχει ήδη παρθεί! Stuttgart. 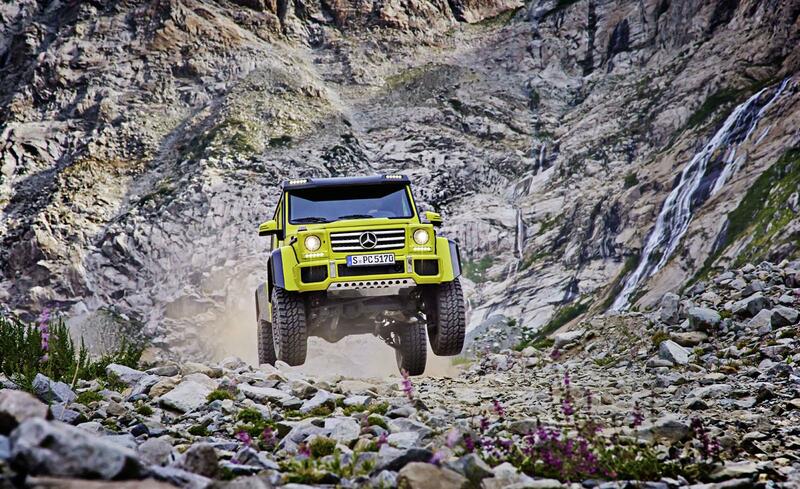 Only a G-Class can better a G-Class. 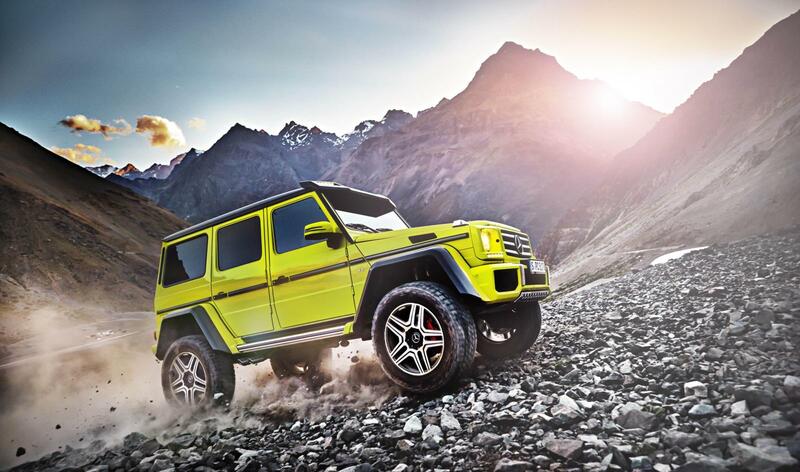 This is the credo followed by the developers withthe Mercedes-Benz G 63 AMG 6×6, and they are now stepping up a gear with the G 500 4×4². 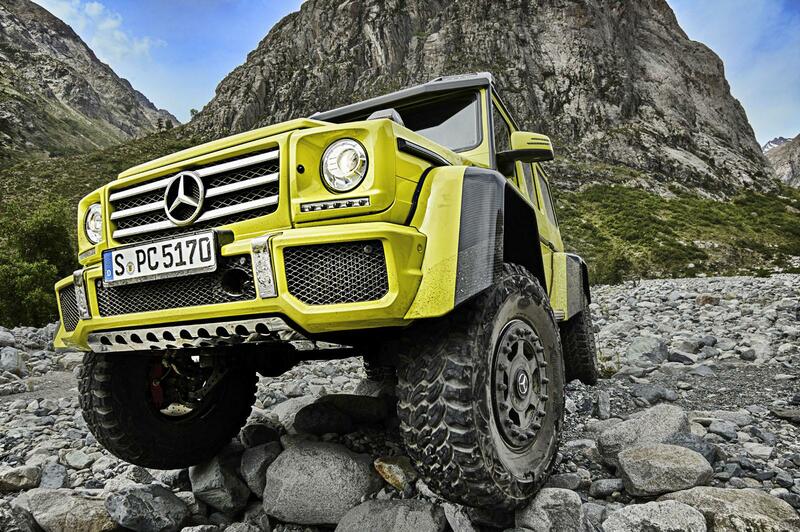 Thebasic recipe for this overcomer of everything is simple: take the superior all-wheel-drivepowertrain including portal axles from the 6×6 – take away one axle – and blend it all with anewly-developed variable chassis and the series-production G-Class body. A large pinch of V8power with 422 hp, a set of 22-inch 325/55 R 22-sized wheels, carbon-fibre detachable body partsand then just gourmet ingredients from the seductive designo Exclusive range for the interior -and the 5-star menu for all off-road enthusiasts is ready. 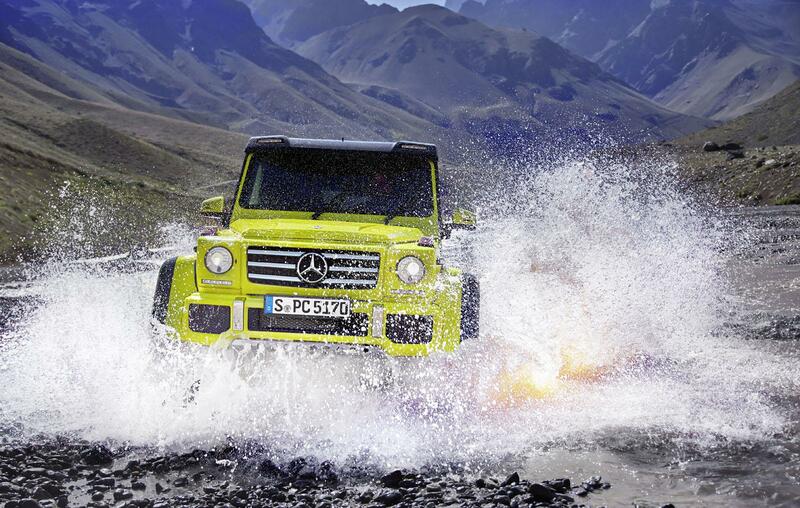 A new addition to the extreme G-Class model family: the G 63 AMG 6×6 has a model brother in the form of the G 500 4×4². The near-series show car is a new highlight in the superlative-rich history of the G-Class and blends all the advantages of the model series. The series-production models of the G-Class supply the unshakeable foundations in the form of the body and ladder-type frame, which compensate for the considerably increased performance of the G 500 4×4² without any problem and also without any type of reinforcements. 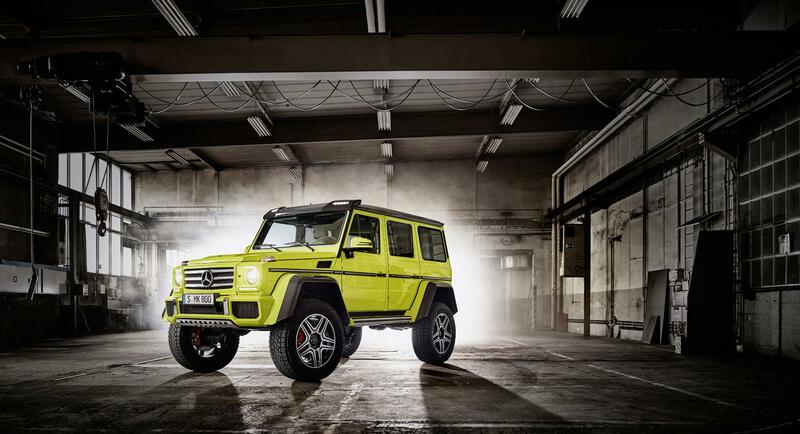 The G 63 AMG 6×6 donates an amended version of the ruggedly determined permanent all-wheel-drive powertrain with portal axles. The engine compartment houses a completely new V8 engine with a displacement of four litres, direct injection and biturbocharging. Also new is the chassis with dual spring/damper struts and adjustable damping. Finally, on the inside, the G 500 4×4² occupants enjoy comfort and an ambience on a par with a luxury saloon. The 4.0 litre V8 biturbo engine in the G 500 4×4² stands out for its sublime power delivery, the targeted lightweight construction, as well as its high efficiency. The newly developed eight-cylinder features twin turbochargers which are not mounted on the outside of the cylinder banks but rather inside the V configuration – what is known as the ‘hot inside V’. The advantages lie in the compact engine design, the optimum response and the low exhaust gas emissions. The piezo direct petrol injection used exclusively at Mercedes-Benz is responsible for the mixture formation. The spray-guided combustion process has been enhanced in the third generation to meet all future statutory requirements. In series production, the highly efficient and economical 4.0-litre V8 biturbo engine would meet the Euro 6 emission standard, including the maximum particulate emissions level that will not take effect until 2016. Twin sidepipes on both sides in front of the rear wheels modulate the G-typical sound of the G 500 4×4² and master the entire repertoire of potent sports cars – from soft mumbling in neutral through sonorous humming in the partial-load range to emphatic booming when accelerating under full load. A welcome side effect of the sidepipes: there is improved off-road capability, because in the rear area there are none of the usual rear silencers, which could otherwise restrict the angle of departure. 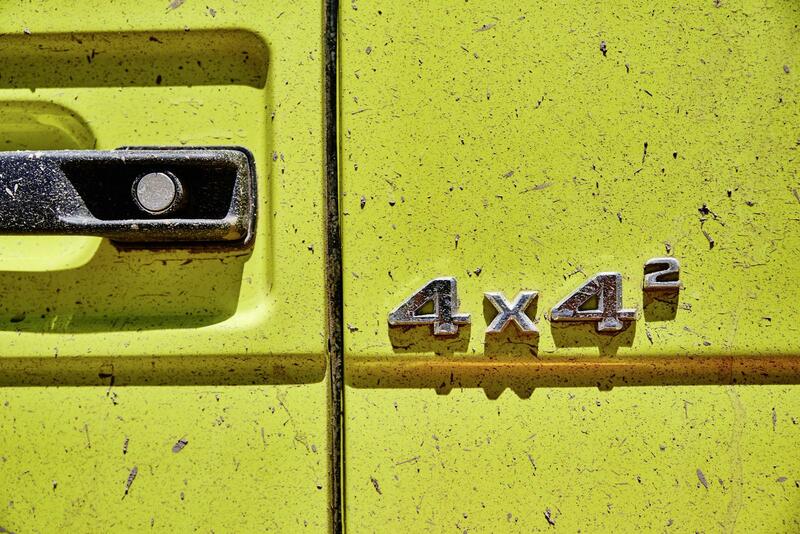 In view of the key data for the chassis and powertrain it seems more than logical that the off-road world starts for the G 500 4×4² where other vehicles capitulate. But it is surprising that the new “G” puts in an absolutely convincing performance on the asphalt. Due to the considerably wider track of the portal axles compared with the series-production car (+299 mm), the large 22-inch 325/55 R 22-sized wheels and the adjustable damping with its Sport mode, the enhanced G-Class drives through bends so dynamically that the occupants feel as though they are in a sports car rather than a cross-country vehicle. This also applies to tours on unsurfaced slopes or snow-bound roads, in which case the performance of a high-powered rally car kicks in. For anyone preferring to use the G 500 4×4² off the beaten track, the optional off-road size 37 x 12.5 x 18-inch MT tyres are recommended. Permanent all-wheel drive, an off-road reduction in the transfer case, portal axles and three differentials lockable whilst on the move will not be found on conventional cross-country vehicles. This results in merciless driving dynamics in all conditions. Even the highest sand dunes are stormed by the show car with ease, whilst rocky terrain is scaled like a chamois, and water is driven through without any problems. 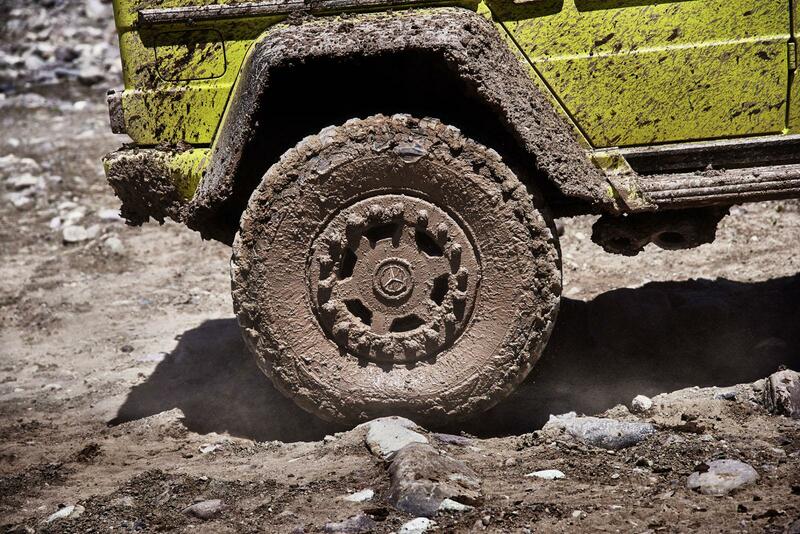 Optimised tyres are available for the G 500 4×4², especially for punishing off-road trips: mud/terrain tyres (M/T) in size 37 x 12.5 x 18 inches on special beadlock wheels. Normally the usual wheel/tyre combinations refuse a traction-promoting lowering of the air pressure for journeys on sand, for example, to 0.5 bar. Here 1.0 bar is the lowest limit, because beneath this low pressure the tyres can come off during steering manoeuvres or ingression of sand can infiltrate the sealing surface between the tyre and wheel rim and thus leads to a slow puncture. 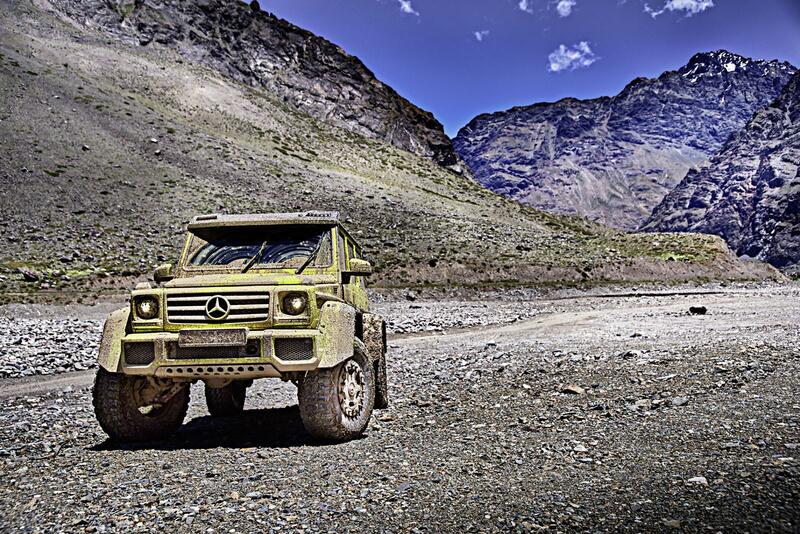 Not so with the G 500 4×4². Here special two-piece 18-inch beadlock wheels are used. With this type of design, during assembly the tyre is pinched in so tightly between the two wheel halves and an inner beadlock ring that it cannot slip off the rim and no sand can enter, even in the case of total loss of air. 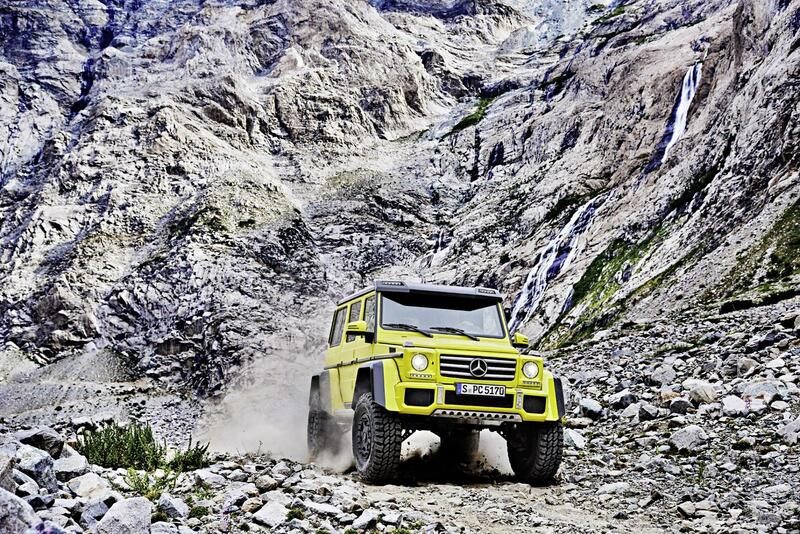 In visual terms the G 500 4×4² raises no doubts as to its passion. The voluminous tyres, the huge distance to the ground, the height of nearly 2.25 metres with a width of virtually 2.10 metres and the clear, straight design command respect right from the first glance. Further highlights: the trim with the integral LED light strips above the windscreen and the elaborate partially painted wheel-arch flarings – both in fine carbon fibre -plus the front bumper on the G 63 AMG and G 65 AMG models. The interior appointments make a sportily luxurious impression. The G 500 4×4² offers an exclusive ambience with the designo Exclusive package. The seat bolsters and head restraints as well as the dashboard, centre console and armrests in the doors are styled in black designo leather with white contrasting topstitching. The seat surfaces and door panels are covered in DINAMICA and impress with their attractive diamond-design quilting. In addition to this there is DINAMICA trim for the roof liner and the body pillars. The Mercedes-Benz G-Class development department located in Graz is the centre of competence where all things “G” are concerned and is responsible for the development and series support of the legendary cross-country vehicle. Furthermore, Graz in Austria has been the production location for all civilian and commercial G-Class vehicles since 1979. Whether and when the decision on series production of the Mercedes-Benz G 500 4×4² will be made depends on the reaction which the near-series show car receives. Προηγούμενο άρθροΈνας φανταστικός -και ξεκαρδιστικός- αγώνας tribute στο Best Motoring!